Welcome to our webpage. Barbara (DO1IQ) and me Ben (DO1BEN) live in Cologne. We run most of our activities together. Home QTH is Cologne (Köln) Loc. : JO3Ømx.
. from April 13th until 22nd . 2019 - IOTA activity run again from Texel Island, IOTA Ref. : EU-038 . Activity is from April 13th until 22nd. Call is PD/DO1BEN. Main activities are in Digimodes on 20 and 40 meters and also sideband operations. More information in Texel Island section of this page. Pse - click here - . Hope to see you all down the logs. 2018 - IOTA activity was again from Texel Island, IOTA Ref. : EU-038 . Activity run from October 13th until 21th. Call was PD/DO1BEN. More information in Texel Island section of this page. Pse - click here - . Thanks to all who came back to my calls. 2018 - OE/DO1BEN - VHF portabel activity again from Austria. First part (July 24 - 27th) from Turracher Höhe. Second part was from July 28th until August 17th from Pruggern (Steiermark area), We where active from several summits and run a Base Station from Base QTH. For more information please - click here - . Thanks to all who came back to my calls..
2017 - IOTA activity was from Texel Island, IOTA Ref. : EU-038 from October 27th until November 4th. Call was PD/DO1BEN. More information in Texel Island section of this page. Pse - click here - . Thanks to all who came back to my call's or piecked me up. 2017 - OE/DO1BEN - VHF portabel activity from Austria. Base QTH was Pruggern (near Schladming) in Steiermark area. Activity was from August 12th until 18th. Thanks to all who gave me a call. For more information please - click here - . 2017 - 9A8BEN - we where active again from Murter Island, July 20th until Augsut 1th. QTH was in the small village of Jezera. Same place as the years before. For more information please use left hand side navigation or click here . 2017 spring time IOTA activity from Texel Island IOTA Ref. : EU-038 run from April 15th until 20th. Calls PD/DO1BEN (Ben) and PD/DO1IQ (Barbara). Main activity was in digimodes, and sideband operations, on 20 and 40 meters. More information in Texel Island section pse - click here -. Tnx to all who came back to my calls. 2016 - OE/DO1BEN - VHF portabel activity from several summits in Kaernten and Vorarlberg area. Active on VHF frequencies around 144.300 MHz. Activity run from July 18th until 29th. We visited several summits. More information - here - . 2015 - OZØIL Lolland Island - IOTA Ref. : EU-029 - activity was from November 5th until 14th. More information about the team and stations set up, live QRG and live cam is avalilabe here OZ0IL Lolland Isl. 2015 IOTA EU-029 Thanks to all who came back to our calls. The 2015 Texel Island activity - IOTA Ref. : EU-038 - was from October 5th until 11th. Calls PD/DO1BEN and PD/DO1IQ. Main activity was in Digimodes (PSK31 and RTTY) and some SSB. For more information please klick - here - . Thanks to all who came back to my calls. OE/DO1BEN - 2015 Summer activity run from July 29th until August 9th. QTH was Turracherr Höhe in Kärnten arrea. Located on 1.700 meters above see level. QTH Locator: JN66WW. Thanks to all who gave me shout. I was active on 10, 15 and 80 meters, mainly in PSK/RTTY and some SSB. Antennas (all homebrew): Full size dipole for 80 meters, verticals for 10 and 15 meters. For more information and pictures pse - klick here - . OZØIL was the callsign for the 2014 Lolland Island activity - IOTA Ref. : EU-029 - Activity was from November 6rd until 14th. More information about the team and stations set up is on OZ0IL Lolland Isl. 2014 IOTA EU-029 Thanks to all who came back to our calls. The 2014 Texel Island activity - IOTA Ref. : EU-038 - was from October 3rd until 12th. Calls PD/DO1BEN and PD/DO1IQ. Main activity was in Digimodes (PSK31 and RTTY) and some SSB. For more information please klick - here - . Hope to all who came back to our calls. 2014 Summer activity as OE/DO1BEN was from July 31th until August 14th. QTH was Gaschurn, a small village in the Montafon area, located on 1.000 meters above see level. Vorarlberg / Austria. QTH Locator: JN56AX. Tnx to all who gave me a call. far up in the north - IOTA Ref. : EU-076 - More information available - cklick here - . 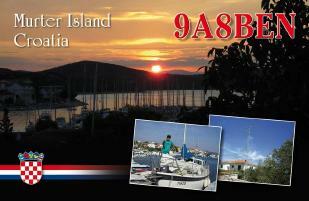 9A8BEN - 2013 - We where active again from Murter Island until August 8th. QTH was the small city of Jezera. Same place as 2012 and 2011. For more information and some pictures please use left hand side navigation or - click here -. OZ/DO1BEN and OZ/DO1IQ. Information about our activities from Lolland Island ( IOTA Ref. : EU-029 ) is available here. We where active in the time from 2006 until 2011.